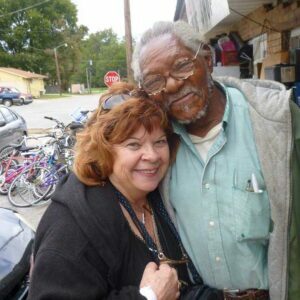 Our sales director Cheryl O’Grady Yearnshaw and her blues lovin’ husband Tom continue their journey through the Delta. 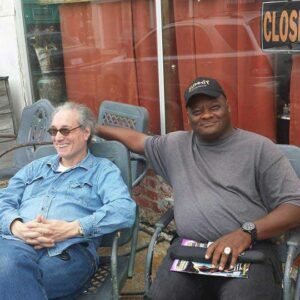 While walking downtown I came across Michael Frank, of the Earwig Music Company and Earnest “Guitar” Roy on the streets in Clarksdale, Mississippi. Earnest was interviewing Michael. I thought it worked the other way around? It was good to see both of them. 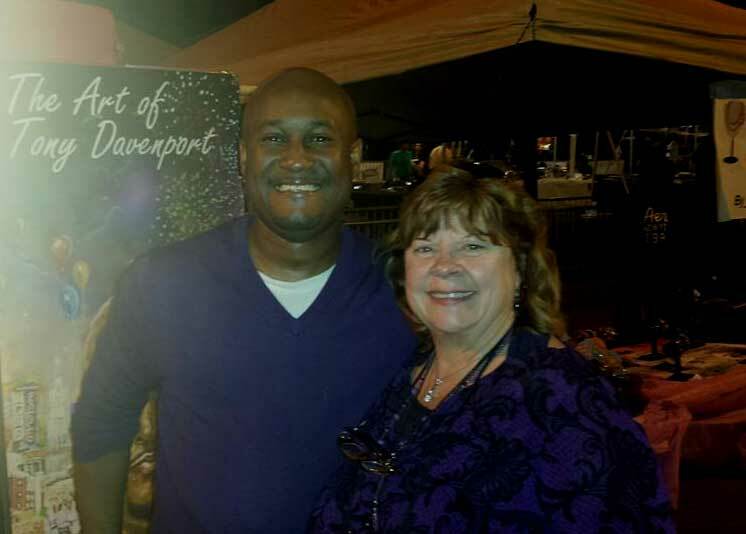 Oct 17 Tony Davenport is the artist who painted our cover in 2012 and Cheryl was happy to run into him at the Paint The Burg Purple and Gold Festival in Vicksburg, Mississippi at his vendor booth. 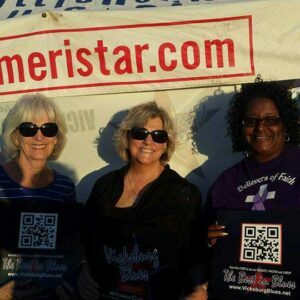 We stopped by the Vicksburg Blues Society booth at the “Paint The Burg Purple & Gold Music Festival” where Norma Habeeb, Shirley Waring & Tina Hayward were having fun! 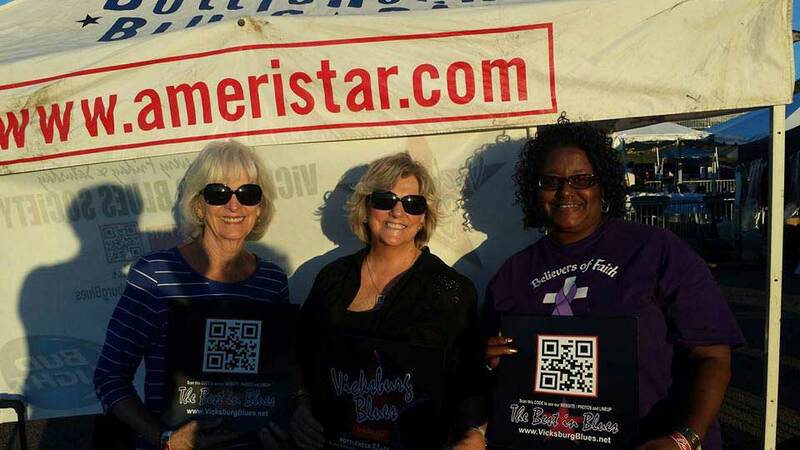 The picture was taken at the Paint the Burg Purple & Gold Music Festival, Vicksburg, MS this weekend and it is always good to see blues societies spreading the word at festivals. This is the first year for this festival and we hope they are around for many more. We had a special treat since Dexter Allen was on the bill and he was on our list to see and we weren’t disappointed. 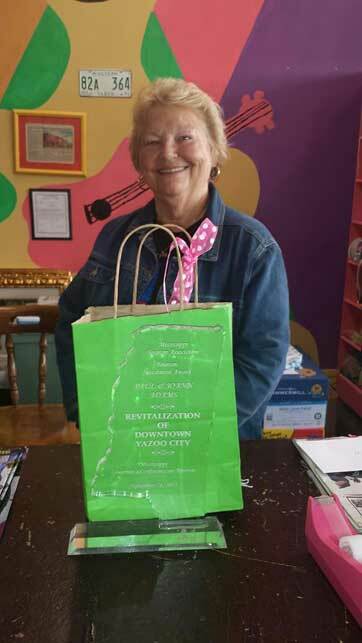 Thanks to Angela Jenkins and all of her volunteers and also the vendors (We found a special t-shirt we had been looking for that was just perfect for a friend). 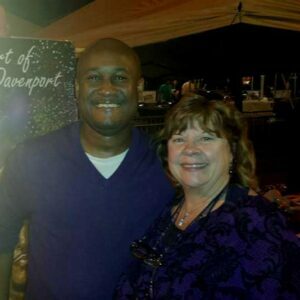 Tom and I were passing through Yazoo City, Mississippi and decided to revisit the old downtown. On a previous visit we had noticed the well preserved buildings. Upon arriving it was good to see so many shops had opened since our last visit five years ago. When we stepped out of the car we heard blues music and discovered it was a speaker system on the corner pole near the stoplight. You could hear the music wherever you walked. We poked our heads into a shop called Main St Market (antiques and boutique shop) and met the owner Joann Adams who had a lot of Southern charm. She had some blues art in her store and she began to talk about her love of the blues. 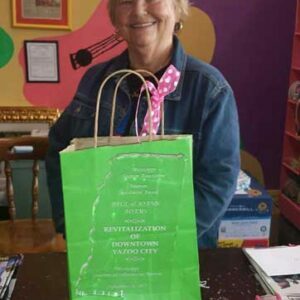 Joann and her husband Paul have purchased several buildings and she was proud to let us know they have added various pieces of blues art in the renovations of the Main St. Hotel and the No Smoking Smoke House which are just a few of the buildings they own. They are helping maintain the rich heritage of blues in their community and take pride in making blues lovers feel comfortable. They are proud recipients of a 2013 Tourism Investment Award. We got to visit David Caldwell the proprietor of Aikei Pro’s Record Shop who goes by Aikei Pro and also is known as the “Fox.” Mr. Caldwell’s record shop goes back to the 60’s and probably further. His present shop is a wide collection of records, cassettes, speakers, radios, bicycles, washing machines and a little bit of everything. His shop has always been a community gathering spot and it stills continues in that capacity. 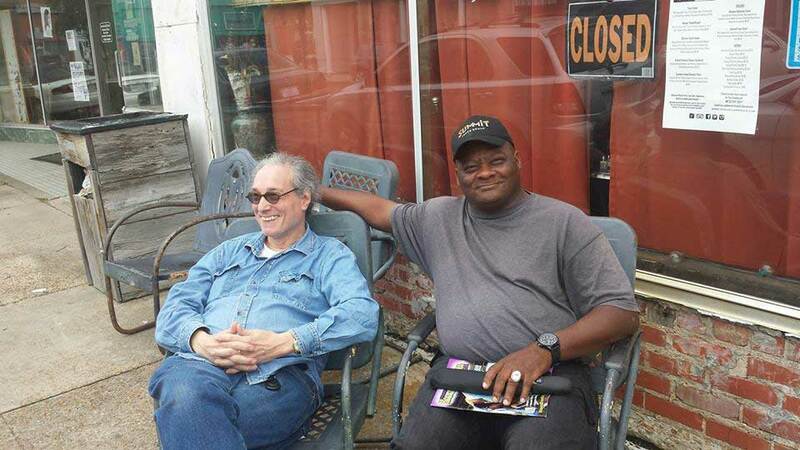 Junior Kimbrough was a good friend and hung out at the record store. Everything is stacked high and it would be quite a feat to sift through the things if you were looking for a particular item. 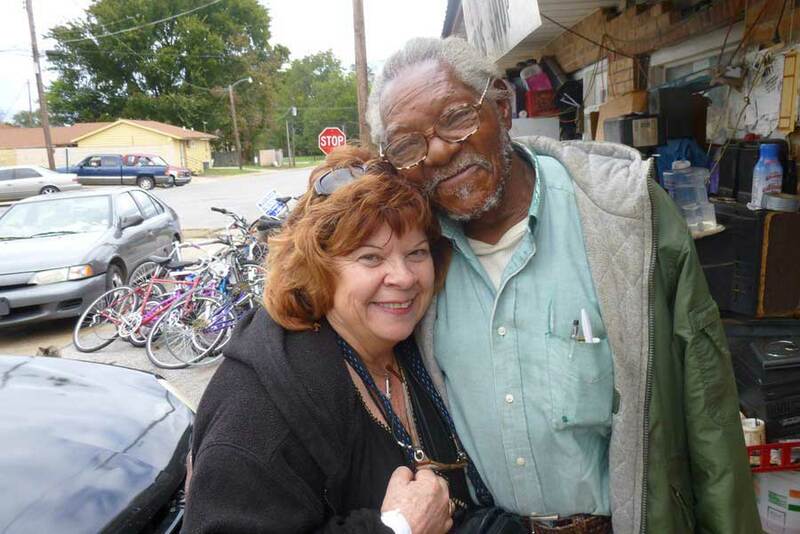 Folks come from around the world to meet Mr. Caldwell and hear him talk about blues history. We have visited Mr. Caldwell in the past and it was great to reconnect with an old friend. 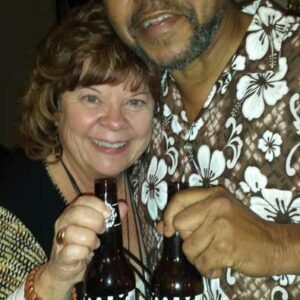 We spent a great evening with Larry Garner and his lovely wife Sandra. 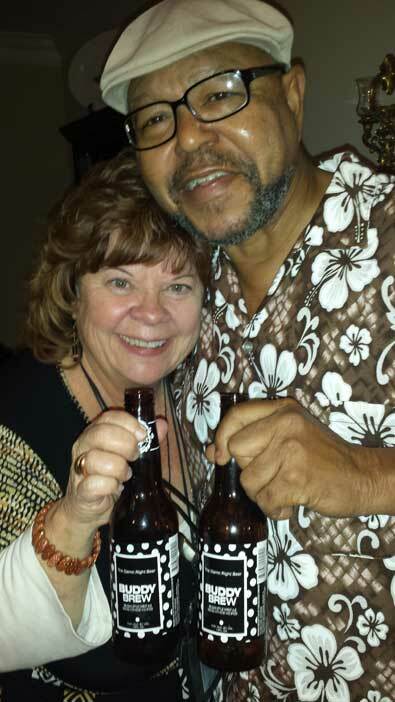 Cheryl and Larry were toasting with a Buddy Brew (Buddy Guy’s new ale). Loved it and now I’ve got to find some more. Thanks Larry for sharing your private stash. See you on the blues highway!